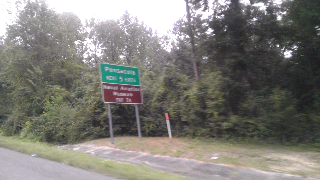 The Gentleman Crafter: Pensacola, Florida! Hello Kathy Orta Files! 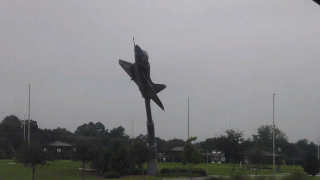 Every time I drive through Pensacola, you just gotta scream out the window Hiya Kathy! She lives amongst these gorgeous pines and by the beautiful water. 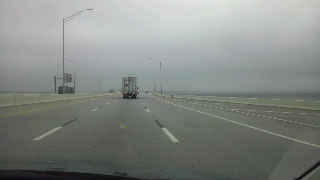 Just went over one of my favorite bridges, The Escambia Bay Bridge as it spans the Escambia Bay. Go figure! LOL! So pretty! From the pictures you can see it's very cloudy and overcast and rather cool actually! 180 miles to Tallahassee, Florida! Only! LOL! Great travels Jim! Lovely pictures of the Navy ships, and I love your dylusions fabs -- especially the mushrooms -- I remember the 60s and those are far out groovy 'shrooms! Working on my second desk -- first one is not lovely, but I learned a lot, so I'm keeping the other one -- also some of my glue melted when I left it in the car! Now I'm working on the two Christmas presents -- and I bought black chipboard! Woo hoo! I think I'm going to do the remote caddy in Notre Dame colors -- they go with any room in our house! Looks pretty gloomy...hope you have good music goin' to keep you awake. I don't do well driving in those conditions. BTW...at 8am this morning it was 52° here in Gtown...and cloudy like Pensacola. Hiya Jim...missing the cold front.....it 47 here right now.....don't think it'll last til you get back tho just sayin!!!!! You aren't missing anything here. Cool, cloudy and currently 50 degrees. Time for some chili! Are you nearly there yet? !